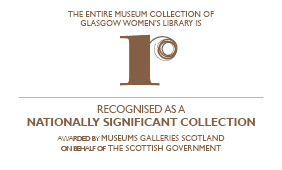 Glasgow Women’s Library is a multi-award winning Accredited Museum. In fact, we are not only unique in Scotland but we are the only Accredited Museum dedicated to women’s history in the whole of the UK. 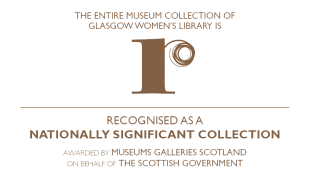 In addition, in December 2015 we were also designated as a ‘Recognised Collection of National Significance’. Our collection of museum artefacts and archives, like our wide array of public events, is open to all. 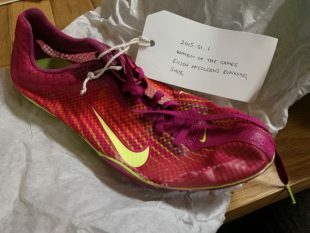 Items in the collection are all donated, making of a rich, diverse and coherent assemblage of artefacts and archives exemplifying the lives of women, charting their historical and contemporary achievements and contributions. From knitting patterns, recipe books and Girls’ Annuals, to Suffragette memorabilia and Radical Feminist campaigning materials, the constantly growing collection contextualizes the linkages across the many spheres that women inhabit within the ‘personal’ and the ‘political.’ With items that date from the early nineteenth century, our collection champions, celebrates and teaches us about how women have shaped lives, families, communities and the country. We have regular programmes of temporary exhibitions and events showcasing items in our collection, and throughout 2017 we will be developing displays of items that will constitute a new permanent collection with Women Making an Exhibition of Themselves, a new initiative funded by Museums Galleries Scotland through the Recognition Fund. We also have ongoing projects that work on specific elements within our collection, often working in partnerships, for example Speaking Out, our joint project with Scottish Women’s Aid. GWL will be working with a group of 12-15 Community Curators from May 2017 to March 2018 who are up for quite literally making an exhibition of themselves. Our Community Curators will choose, research, digitise and interpret the artefacts from our collections that tell some of the stories of how women have shaped their own lives and those of their broader communities – and how ultimately they have changed hearts, minds and laws. The Community Curators will work alongside staff and an Artist/Designer to create permanent displays showcasing GWL’s Recognised Collections both within the our building in Bridgeton and as Women on Wheels mobile units to travel across Scotland to community settings. This will give us an opportunity to make a larger part of our unique collections more open and accessible for all. To find out more about the project, and how you can become one of our Community Curators, visit the Women Making an Exhibition of Themselves page. Find out more about the NMRD here. 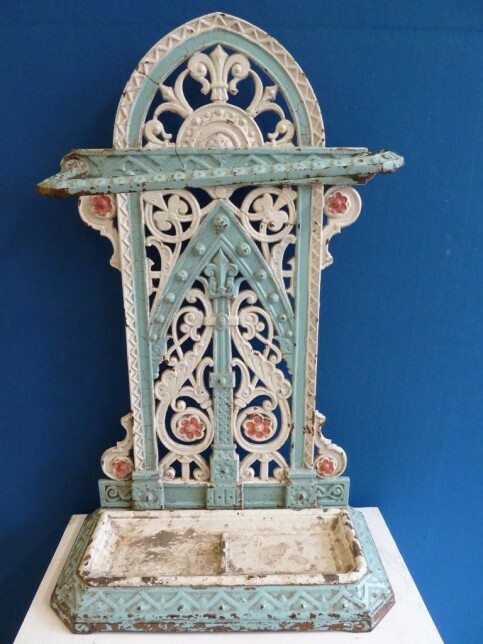 Reputed to have been painted by Suffragettes imprisoned in Duke Street Prison in Glasgow, this umbrella stand is one of the jewels in GWL’s Collection. We are happy to answer any questions you may have about our collections and can help point you in the right direction with your research – please contact us. We will aim to answer detailed research enquiries within two weeks. For research enquiries that require more than 30 minutes we will recommend that you pay for our research service.